There is a lot of fuss about two new papers arguing, from mathematical models, that extreme downpours have become and will become more common in the northern hemisphere and specifically in Britain as a result of man-made climate change. Let's ignore the fact that this looks awfully similar to the habit of blaming specific weather events on climate trends, something we `lukewarmers' (who think climate change is real but slow enough to adapt to through the foreseeable future) are reprimanded for doing when we point out that an especially cold winter or cool summer weakens the case for the alarming version of the theory. So now we can do that too, can we? The researchers suggest there is nothing that can explain this trend except the slow steady increase in temperatures caused by greenhouse gas emissions. I'm sorry but when I was a scientist correlation was not considered a proof of causation. In other words, researchers have yet to find evidence of more-extreme weather patterns over the period, contrary to what the models predict. 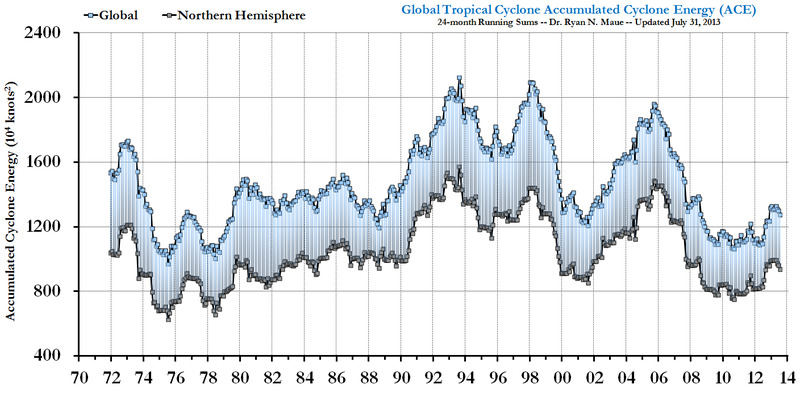 Let's ignore the fact that 2010-one of the hottest years in recent memory-saw the fewest tropical cyclones (including hurricanes) since 1970, and that the global cumulative energy in these cyclones was among the lowest , which is inconvenient, to say the least. Let's instead assume these two papers are right, that there is an increase in extreme downpours and that it is caused by rising greenhouse gas emissions. How lethal are downpours compared with, say, cold winters? We all agree that global warming will create fewer cold winters, right? And since more people die in cold weather than in hot weather, global warming will reduce deaths. Is that effect bigger or smaller than the extra deaths from downpours? Answer: much, much bigger. Here are some numbers. The annual excess mortality in winter is over 100,000 in the US, 50,000 in Japan, 25,000 in Britain and even 23,000 in Spain. Just a 10% drop in those numbers and you are saving tens of thousands of lives, far more than die in floods. That autumn saw the highest rains in England and Wales since records began in 1766. The Hampshire village of Hambledon was underwater for six weeks, and insurers put the final cost to the country at more than £1bn. But, as far as we can make out, nobody died. As it happens, the number of people dying from extreme weather events has gone down by 93% since the 1920s. Was this because we controlled the weather? No. It was because we adapted to it. So even if extreme downpours do increase, death rates as a result of them will continue to decline so long as we continue to get more people access to roads, telephones, houses and information. It's like malaria: it retreated rapidly in the twentieth century despite rising temperatures, and it will retreat rapidly in the twenty-first century despite rising temperatures. As the above figure shows, globally the average annual death toll from all extreme weather events is about 35,000. Compare this to the hundreds of thousands of excess winter deaths that occur annually. Perhaps we should try to control winter before we tackle climate change! Oddly enough, while we may not be able to control the weather, in the U.S., millions have done the next best thing-they have migrated from colder northeastern climes to the warmer southwestern states. This, according to a paper in MIT Press's Review of Economics and Statistics by econometricians Deschênes and Moretti, is responsible for 8%-15% of the total gains in life expectancy in the U.S. population from 1970 to 2000. So even if it is true, the downpour argument does not even begin to help make the case for carbon mitigation policies.